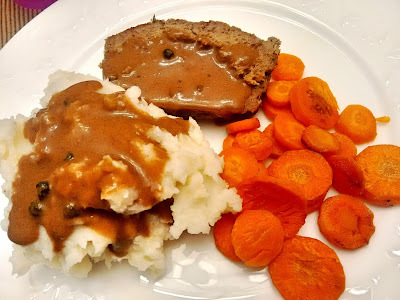 Meatloaf madness! Anna asked for meatloaf for dinner last week, so we made it, but ended up freezing the raw meatloaf in the loaf pan because our schedules were too hectic. I defrosted it in the fridge, which was awesome to come home and just pop it in the oven. I will have to do them in advance more often! I cheated and used instant beef gravy for topping. Combine all ingredients in a large mixing bowl. Mix until uniform. Grease a loaf pan with canola oil spray. Pack meat mixture into the pan. Preheat oven to 375°F. Place loaf in oven for 60 minutes. Remove from oven, drain excess fat and grease into a metal bowl (when cooled, dispose of excess fat in a freezer bag and throw out). Place under broiler for 5 minutes. Remove from oven and let stand for 15 to 20 minutes. Prepare gravy while meatloaf stands. Remove from loaf pan and slice.